Celebrate One Year of Marriage with a Single Circle of Gold... A Circle for a whole life together, a full twist with one diamond, for a full year of marriage. 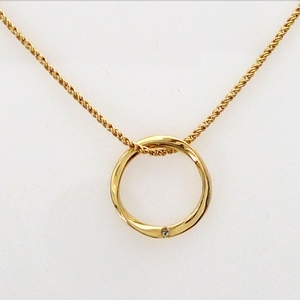 This delicate new pendant is a circle of 18k gold (1/2" diameter). And within the circle, you can see the profile does one full twist. A single diamond adorns it. Comes with a gold chain. Perfectly suited for a 1st anniversary gift. See all our 1st Anniversary Gifts.